About the book: Mia Reynolds is the host of popular Vlog show, Try My Life, where she tries other folks’ jobs while the camera rolls. So far, each episode has been filmed in Oregon, yet when Mia gets an invitation from her Granddad to try life on his ranch in Montana, she’s ready for roping, riding, and even shoveling piles of muck. 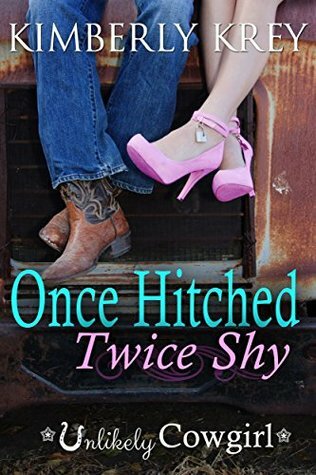 What Mia isn’t prepared for is losing her heart to the brooding ranch hand, Hunter Coleman. Hunter lost big in love when his ex left him for her Hollywood dreams. When Mia Reynolds spends a week on the ranch to film her hit online show, Hunter is sure she’s just another version of his self-centered ex. But all too soon he sees new sides of the fun-loving woman that urge him to toss his wounded heart to the wind and give love another try. Once the sparks start to fly, Mia's forced to make a difficult choice, one that gives Hunter a bad case of Déjà vu. When the fear of losing another woman to the spotlight becomes too much, Hunter might have to cut his losses before he gets in too deep. The trouble is, he's already in over his head. My review: I loved everything about this book! I loved the characters, the plot, the cute modern romance. This one was so much fun! Let's start with Mia. Mia seems to have one of those personalities where everyone wants to be around her, she just seems to have a contagious happiness about her. I loved the way that just works for her YouTube Vlog. The whole idea of Try My Life just made me think and think and want to watch it! I loved the way she ends up in Montana on her grandpa's ranch. And that's where she meets Hunter. I liked Hunter, but he was a bit on again, off again about Mia and that bugged me a bit. I loved the way he was always trying to shove the other ranch hands out of the way and be the one by Mia. I did like the way he told his ex to get lost, yet still be kind at the same time. The romance in this one is really light and fun! This is one of those books you can read quickly and want to read over and over again. I loved the scene where Hunter's ex shows up, and the scene that comes from that is perfect! This is just the kind of romance I like to read. It's fun, modern and it just works! I borrowed this book using Amazon Prime.